Policies that create insecurity also create the ground for inflated budgetary allocations. For a country whose Army Chief claimed in June last that they were prepared to face “two and half front war” (war with China, Pakistan and insurgency at home) it comes as a surprise that the vice chief of Army Staff Lt General Sarath Chand told the Standing committee of Parliament for Defense that the Indian government has provided “insufficient funds” to even meet the requirement of ten days of ammunition for an ‘intense war’. He went on to complain that Army received only 60% of the funds it had asked for; their projected need was Rs 445.7 bn, but were allotted only Rs 268.2 bn. He said that against “committed liabilities” for 125 on-going schemes of Rs 290.3 bn (annual installment for purchases earlier made) and “new schemes” for which first installment was likely, the inadequate actual allocation means that some of these liabilities will be passed to the financial year 2018-19. It was said that a “modern army” should have one third of “vintage” category weaponry, one third current category and one third state of the art. 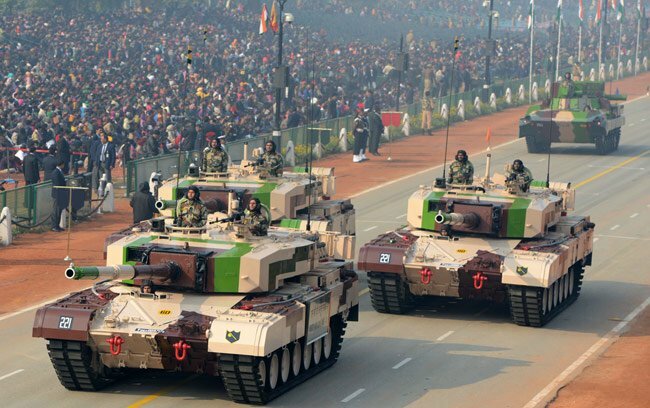 Against this Indian Army has 68% of “vintage” category, 24% of current and mere 8% state of the art category weapons. Army chief’s “two and half front war” preparedness was hyperbole and none other than a serving fellow general rubbished it. Speaking at a seminar on “geo-strategic manifestation in Pakistan and its Implications” on February 28 organized by the Panjab University, GoC-in-C of Western Command Lt General Surinder Singh said that “two front wars was never good idea, never a smart idea to fight two front war”. At the same seminar a day earlier another senior serving officer Lt General MH Atravane, GoC-in-C of Army Training Command, reminded the audience that search for peace requires “statesmanship not brinkmanship”. And he warned that “(w)e need to take a look at it (Pakistan) & not make the same mistakes, particularly in light of growing radicalization and intolerance within our own society over mundane issues”. Their implied criticism of current wisdom propagated by jingoistic media and the everyday exchange of gun and now even heavy artillery shelling causing destruction and displacement carry costs which are never brought into discussion. It is this which provides the excuse for making “emergency procurement” at exorbitant cost. For instance the Army claimed in April 2017 that 5.56 mm bullets for INSAS rifles do not kill militants effectively and want to go in for 7.62 bullets and therefore also new assault rifles. Just because Army pitched this claim on a ridiculous ground that 5.56 bullets do not kill even after two or three bullets hit a militant, the question arises: is this a sudden discovery after 30 years of using the older bullets? It deserves a closer look. The fascination for new weapons and talk of state of the art bamboozles the common person but there is yet to be conclusive proof that argues against usefulness and versatility of Second World War vintage Russian assault AK range of rifles. So the allure of state of the art cannot hide the fact that a lot of “vintage” weaponry is still useful. Besides, emergency procurement always entails higher cost and full payment instead of installments. This eats up allocations. Indeed “emergency procurement” is usually a mark of poor planning and lack of concern for prudent use of resources. Again if the Army bases its projection on causing “pain” to Pakistan and keeping the borders with its two neighbours tense then no matter what, the fund requirement would shoot up. All requirements are based on assessment of security perspective and also represent utter failure of diplomacy and political leadership to bring the violations by both India and Pakistan along their borders/ceasefire line to an end. A war of attrition is costly and a waste of human and material resources. So there is need to read the sub-text and not get carried away by jingoist rhetoric. Point is that the concern over inadequate funds must be contextualized with reference to the misplaced belief in India’s approach to cause pain to Pakistan and to stand up to China. It should also be clear to most that forces pitch in addition exaggerated demands. These projections must be subjected to scrutiny and measured against paying capacity of the public exchequer. If the Ministry of Finance has shot down these projections they would have good reasons for doing so because ideologically the political leadership in MoF and MoD remains hawkish and no less jingoistic than rest of ‘sangh parivar’. Thus the Indian Air Force projected a requirement of Rs 777 bn (but was allotted 45% of it or Rs 357 bn) under the plea of preparing for “two front war” scenario which requires 42 squadrons. And the Navy asked for Rs 357 bn (received Rs 200 bn). And yet, even if orders were to be placed now it will take a decade before new hardware is received in India. So, existing weapon stocks must be sufficient to meet any immediate need. However, the Army claims that in their case the funds are inadequate to meet even current contractual obligations. They needed Rs 290 bn for this whereas they were allotted Rs 268 bn. So consider this. A number of camps of India’s armed forces have come under attack such as Pathankot in January 2016 followed by attacks on armed forces camps in Uri, Nagrota, Sunjwan. Lt Genral Sarath Chand told the Standing Committee that “it took a series of attacks and numerous casualties for raising the brows and delegation of power to the vice chief of army staff to spend Rs 141 bn for strengthening perimeter security”. So army had to re-prioritise and use allocated funds by reducing requirements. An elementary question is evaded here. How is it possible for an army which has been in Jammu and Kashmir since 1947 and waging counter-insurgency since 1990 to be unable to protect its own camps with existing allocation? Why was “perimeter security” not a matter of concern in previous years? And why do they have to scurry now in great hurry and spend massive funds to make up for their own mistakes? Which other armed force in the world ignores its own perimeter security or is indifferent to it? By being indulgent towards Armed forces leadership for failing to do the elementary, secure their own camps, the emergency requirement gets excused? Problem with budget allocation has less to do with funds but more to do with exaggerated projections of conflict scenario which underpin it. Maybe Indian Army should ask itself why is it that they need 170,000 soldiers to man 3800 kms of Line of Actual Control with China but need in just J&K alone 300,000 plus soldiers. Surely the ceasefire violations along Line of Control with Pakistan and stepped up anti-militant operations in the hinterland ties up a huge force, eats up a large share of army’s budget and also contributes to casualties suffered by their personnel scaling up the wage and pension bill. In order to boost the morale of the soldier, for instance, MoD has now decided that soldiers posted along LAC will get the same monetary benefit as their colleagues enjoy in J&K or along borders with Pakistan for injury or death. When we add up all this it becomes evident that “insufficient funds” is a mis-diagnosis whereas the problem is governments’ obduracy in persisting with ‘five bullet for one bullet’ approach with Pakistan which means that India uses up more of its ammunition than Pakistan in order to cause “pain” three to four times what they cause us. As also by refusing to politically resolve Kashmir question the government contributes to wastage of scarce resources by privileging military suppression of a popular movement over political resolution. In other words problem does not lie in budgetary allocations, which at Rs 4 trillion or 2.16% of the GDP for 2018-19 is quite hefty, but rather in persisting with an approach which creates a security scenario which throws up the clamour for more and yet more funds.